Elephant Gin is a popular Craft Gin available from 31dover.com in 50cl to buy online. Visit 31dover.com for the best price for 50cl of Elephant Gin or compare prices on our other Craft Gin products. Elephant Gin is an independent, artisan London Dry Gin inspired by Africa. Each bottle is custom made. The company contributes 15% of all profits to two African elephant foundations to support the preservation of the African wildlife and help ensure that future generations will also be able to explore these magnificent landscapes. Elephant Gin is distilled using 14 botanicals, including rare African ingredients, to create the gins distinctive flavour profile: The gins distinct nose first yields a subtle juniper aroma, with an undertone of mountain pine and other herbaceous notes. The taste is complex but strikingly smooth, encompassing floral, fruity and spicy flavours which can be enjoyed both straight and in a cocktail. Where to buy Elephant Gin ? Elephant Gin Supermarkets & Stockists. 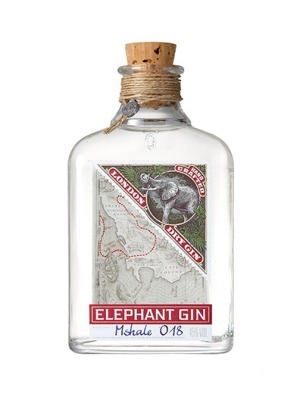 You can buy Elephant Gin online in most retailers and find it in the Craft Gin aisle in supermarkets but we found the best deals online for Elephant Gin in 31dover.com, Amazon.co.uk, DrinkSupermarket.com, TheDrinkShop, and others. Compare the current price of Elephant Gin in 50cl size in the table of offers below. Simply click on the button to order Elephant Gin online now.